Richard Rogers submitted this photo and caption. 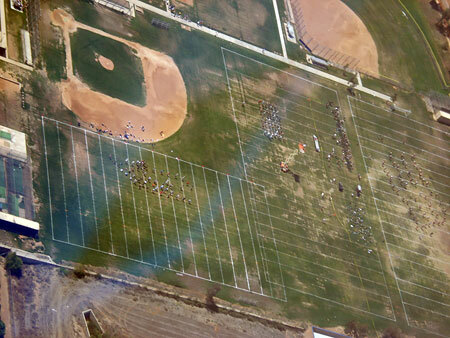 This photo if of the Bluecoats practicing at King High School in Riverside, Calif. during the week of the 2007 World Championships. The picture was provided by Joleen Klundt a longtime DCI fan whose son Jeff is a member of the King High School marching band and drum line. Her older son Aaron took the photo while on a ride along in a Riverside County Sherriff's helicopter.